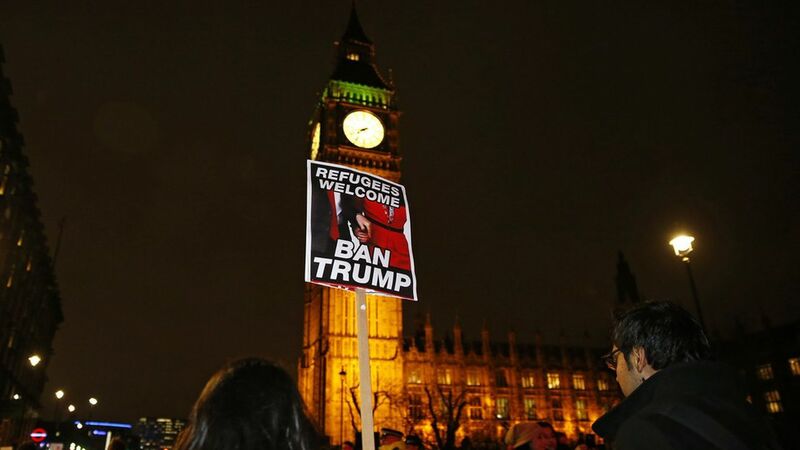 In the wake of the executive order banning entry to the United States for people from seven majority-Muslim countries, The Times of London reports that Prime Minister Theresa May is facing pressure from Queen Elizabeth II after May's announcement at a joint press conference last Friday that President Trump would be granted a state visit to the United Kingdom. An online petition in the UK to cancel the state visit has reached 1.5 million signatures and tens of thousands of protestors amassed outside Downing Street tonight. Buckingham Palace reportedly expressed dismay that the Queen — famously neutral — was being dragged into a political event. The former head of the UK's Foreign Office: "It would have been far wiser to wait to see what sort of president he would turn out to be before advising the Queen to invite him. Now the Queen is put in a very difficult position."